Looking for music to enjoy with family and friends this Purim? Here at the Recorded Sound Archives at FAU Libraries, we would like to highlight the voices of William Wolff and Joan Mey one of several artists available in the Purim Collection off the album, Songs for Tu Bishvat and Purim. 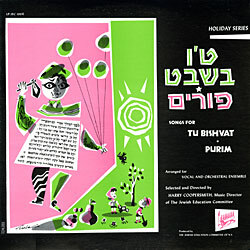 This album was produced by the Jewish Education Committee of New York, in 1965 and was compiled by Harry Coopersmith to help engage youngsters in the customs and traditions of the Jewish religion. These recordings reflect a time in American history when Conservative Jewish educators sought to spirtually bind Jews together through song. To listen to this album, click here. To view other recordings by the Jewish Education Committee of New York, click here. Discover over 20 other recordings for you to enjoy with family and friends in the Purim Collection. 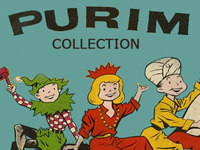 Interested in past posts related to Purim, click here.